The Santa Catalina Mountains is located to the northeast of Tucson area in Arizona. It is the most prominent geographical feature in the region with its highest peak rising up to 9,157 feet above sea level. The mountains were the site of a gold rush in 1880s. Following the end of the Californian Gold Rush, many of the miners begun prospecting the neighboring territories for gold and other valuable minerals such as silver, copper, and diamond. Considerable discoveries were made all throughout Arizona. In the early 1880s, prospectors discovered gold trapped in quartz on the north side of the Catalina Mountains. This set off the Arizona gold rush bringing in thousands of miners in the area. Once the gold rush started wealthy industrialists and a number of early prospectors staked mining claims, set up mining camps and mined thousands of ounces of gold from the mountains. Placer gold was the first to be discovered and was mined in creeks and rivers around the mountain. Placer mine continued in the mountains between the 1800s and 1949 with many mining sites producing over 1000 ounces of gold. Water was only available for a short period of the years, and many of the placers were bone-dry making gold recovery a real challenge. Later on, hardrock gold was mined on the mountain sides all over the Santa Catalinas. Although the active mining of gold in the mountains is long dead, the Santa Catalina Mountains still possess lucrative prospects for gold hunters. According to a report by the US Bureau of Mines, the mountains still has some gold yet to be discovered. Small-scale miners using metal detectors and drywashers still find gold here. In recent times, prospectors have found some rich gold in form of flakes and small nuggets in several places across the mountain. The Canada del Oro gold mine was one of the earliest gold mines around the Santa Catalina Mountains. The Mines is located at about 35 miles from Tucson and lies on a 400-acre property. The Mine was worked from the 1880s to early 1900s and produced quite a significant amount of gold. It is believed that gold mining in the Cañada del Oro within the Santa Catalina Mountains could actually have started as early as the 1500s by early Spanish explorers. The mining was done by the Spaniard prospectors on a small scale until the 1870s and 1880s when the gold miners from California and other mining areas arrived in the region. Today, there are several claims around the site still being actively prospected. 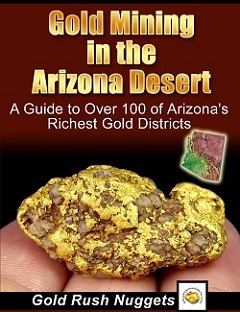 The Cañada del Oro and surrounding areas still have potential for gold mining in Arizona. This was one of the richest gold mines in the Santa Catalina Mountains. The mine was opened in 1885 by Buffalo Bill Cody. The mine is located about a mile to the Northeast of Apache Peak, two miles to the south-west of Campo Bonito and about a half a mile to the south of the American Flag Hill. The mine was productive between 1886 and 1888 producing over 9000 ounces of gold. It was closed after 1888 and was reopened several times, with little success. Today the mine is abandoned but recent studies show that it still contains some gold, although in smaller quantities that are not sufficient for commercial mining. The region around the mine presents a perfect opportunity for gold prospectors to find undiscovered gold sources. The Oracle mine was staked in 1877 by Albert Weldon. The mine was named after the ship that brought Weldon the United States. The mine produced a significant amount of gold leading to the establishment of the Oracle mining camp which later became the town of Oracle. Located in the Old Hat mining district the Oracle Mine brought more people to the camp leading to the development of a town. In 1878, Weldon teamed up with Alexander McKay to stake the Christmas Gold Mine just a stone throw away from the Oracle Mine. They then staked the New Year's Mine in January 1879 just a short distance to the north of the Christmas Mine. All these mines were set on the Kalamazo ore body and were quite productive through the 1880s. Campo Bonito was among the earliest mining camps to be established in the Santa Catalina Mountains within the Old Hat mining district in the 1880s. This area was home to the Campo Bonito mines that include several small gold mines and gold claims. Some of the key mines and claims forming the Campo Bonito include the Red Dog claim, Memory Lane group, Juniper claim, Morningstar claims, Taraldson claim and the Juniper claims among others. Some other claims that now are part of the Coronado National forest include the Santa Rosa Mine, the Maudina Mine claim, and the High Jinks Mines among others. The Camp Bonito mines had mixed fortune. Some were quite productive while others didn't produce much gold. The mines also produced several other minerals including calcite, galena, pyrite, talc, tungsten, dolomite, wulfenite and scheelite.